Too often, we settle for the notion that self-care means giving ourselves treats and rewards for good behavior. But it’s so much more than that. Welcome to the self-care revolution! A day of indulgence at a spa—or at home on the couch—might help us unwind and feel temporarily renewed, but is that all there is to self-care? In this book Tracey Cleantis changes the dialogue and shows why real self-care is more than just routine self-indulgence—it’s a lifelong practice that’s essential to finding fulfillment and joy. An Invitation to Self-Care uncovers seven principles of care that are rooted in self-empowerment and self-knowledge. Through personal stories and observations, exercises and quizzes, and interviews with experts and everyday people, Tracey invites you to consider self-care across your relationships, finances, spiritual and professional life—and more. By accepting who we are, what we need, and how those needs evolve over time, we create space for self-care’s transformational magic in our lives. In fact, an authentic self-care practice is the secret to the life you’ve always wanted. This is a magnificent book. 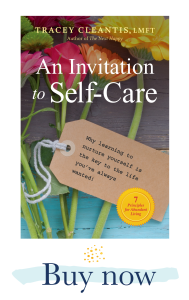 When I first brought self-care into the mainstream back in 1992, I encountered comments like ‘Well, I do my nails!’ or ‘I work out.’ The idea that self-care is how you want to approach your whole life was hard for some to grasp-and that often included me. . . . Tracey’s book will help! She’s done a fantastic job pointing the way. Buy this book! Please contact Tracey Cleantis Dwyer at (661) 803-3061 to begin your transformational journey or complete the form below.